Code Behind technique to visually separate parts of code in different files. In Code Cruiser Code Behind technique is used along with Custom Code. 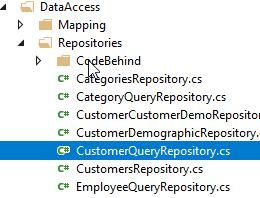 That means that this folder contains base classes and the upper folder contains child classes. Base classes contains generated code, child classes on the other way are almost empty (only constructor is present). So why it is done so and what is the profit of this structure? Basically you could modify anything in Source folder and don't bother about CodeBehind folders (Extract Custom Code mode will swallow all the cases). But this way will dramatically increase probability of export conflicts (when Custom Code is applied). The main purpose of these child classes is to provide a file/class container for modification with minimum risk of original file changes. This is why these files contain minimum code (less code - less conflicts). We strongly recommend to use child classes (near CodeBehind folders) to place your logic. (!) If there are other places in you source code that constantly produces export conflicts please contact our support team via ticket system we will add Code Behind support for them. You may notice special commented lines in constructor of Code Behind classes. We recommend to place your dependencies between these comment lines. It will make easier (1 row update) to update base class dependencies in case of Custom Code export conflicts.